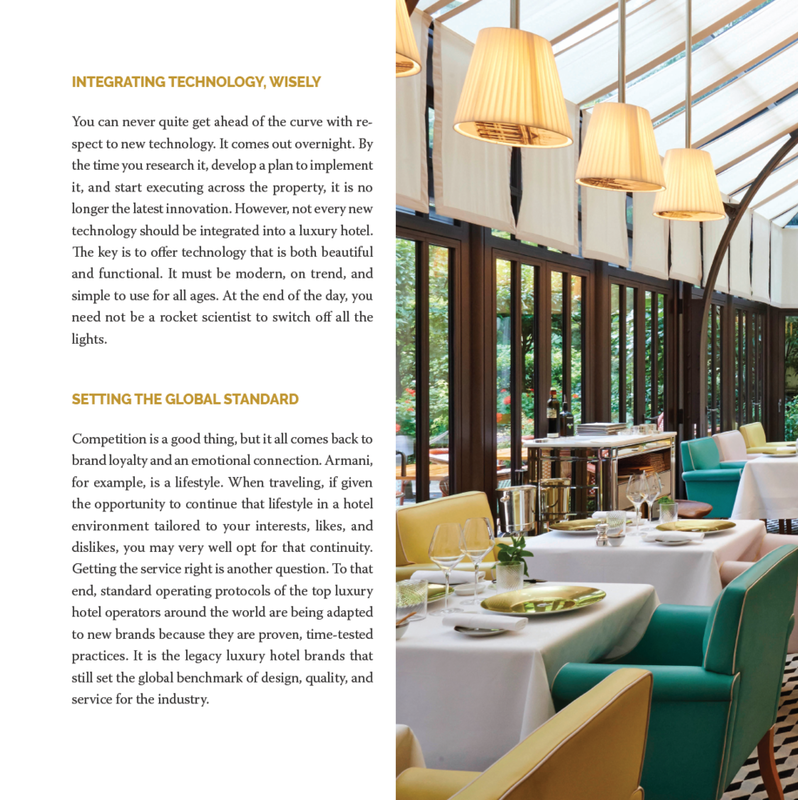 Launching to critical acclaim by industry experts and executives, A Wealth of Insight profiles more than thirty-five of the world’s best luxury hoteliers on exactly what it takes to lead and manage some of the most legendary hotels and resorts. Each executive profile includes bite-size insights, stunning photography and real-life examples on recruiting, culture, technology, marketing, branding, personalization, authenticity, anticipation, design, partnerships and more. Hoteliers also detail the most significant trends impacting the sector today, and how those trends will shape the future of luxury hospitality. The sheer scale and scope of this effort—to distill industry wisdom across two dozen countries—is unprecedented. In spending nearly a decade distilling leadership and management insights from some of the most innovative and influential chief executives across industries, I traversed the globe from San Francisco to Stockholm to Seoul, and often laid rest at a world-class hotel befitting of my interviewees. In fact, many discussions took place in glamorous suites, lobbies, and ballrooms. Over the years, the luxury hotel—symbolic of my travels and journalism—shifted from stage to spotlight. From the moment I arrived, every aspect of the guest experience was carefully crafted, catering to all five senses. It was awe-inspiring, delightful and flawless. I became obsessed with how such properties balanced intuitive care with military precision, so I turned my attention to pulling back the curtain and uncovering the secret to creating a world-class guest experience. Every hotelier featured in this book exudes a fundamental understanding of genuine human connection. They reveal a mastery in the art and science of recruiting, developing, motivating and managing a world-class team—explicitly designed to deliver on the promise of personalized luxury at every stage of the guest experience. This is one of the most profound insights to emerge. The most beautiful of hotels in the most coveted of locations cannot deliver on that promise without an extraordinarily passionate and talented team committed to perfection. There is no alternative. In an industry that now Googles guests in advance of their stay to glean personal and professional interests, likes and dislikes, anticipatory service is not simply possessing information, but acting on it deliberately, thoughtfully and discreetly. For aspiring and current general managers of luxury hotels, for hospitality executives in search of a practical guide on how best to deliver a world-class guest experience, and for the modern luxury traveler eager to go behind the scenes, A Wealth of Insight is the holy grail of five-star leadership and management. A Wealth of Insight features General Manager’s of the Waldorf Astoria Beverly Hills, Wynn Las Vegas, The Plaza Hotel in New York City, The Savoy Hotel in London, Le Royal Monceau Raffles in Paris, Four Seasons Hotel Florence, Six Senses Duoro Valley in Portugal, Pera Palace Hotel Jumeirah in Istanbul, Singita Serengeti in Tanzania, The Ritz-Carlton Riyadh, The Taj Mahal Palace in Mumbai, Belmond Grand Hotel Europe in St. Petersburg, Lotte Hotel Moscow, COMO Uma Paro in Bhutan, Hotel Indonesia Kempinski, The St. Regis Bangkok, Rosewood Beijing, The Landmark Mandarin Oriental in Hong Kong, Outrigger Fiji Beach Resort, Park Hyatt Maldives Hadahaa, Qasr Al Sarab Desert Resort by Anantara in Abu Dhabi and many more award-winning luxury hotels and resorts around the world.